Do you find yourself with leftover seeds after doing your spring planting? When I have leftover seeds I usually put aside some for next year in case this year’s crop fails. Even if the germination rate won’t be as high next year it might be better than none at all. Some of my plants are so prolific that I have many more seeds than I can use in two seasons. I occasionally even have extras of commercial seeds because the packet I bought contains more than I need. When that happens I like to give the seeds away or trade them. Local gardening clubs and online groups sometimes host seed swaps. A major advantage to acquiring seeds at a local swap is that you are trading with people who have grown the plants in similar conditions and soil as your own. The plants that survived well enough to produce seed are likely to grow well for you too. Whether the seeds are saved for your own use or for trading, keeping good records is important. I keep a three-ring binder with a page for each plant that I grow. I write on the page all the information I have for the source of that plant. If I grew it from commercial seed, I tape that packet on the page so I can refer back to it. If I acquired the seeds through a swap, I record as much information as possible. If the trader included the species name, you can look up the rest of what you need to know, but sometimes traders include growing tips also which is very handy. The ideal way to package seeds for a swap is in a paper envelope with information about the plant written on it. Species name and cultivar name (if any) and date of harvest I would say is the bare minimum of information you should include. Plastic bags and empty film containers are sometimes used. These are not as good for storage as paper since they hold in moisture. If the seeds were not dried thoroughly before packaging, that could cause a mold problem. If you get seeds packaged in a plastic container and are not going to plant them right away, I recommend transferring them to a paper envelope as soon as possible. You can purchase small paper envelopes to store your seeds or download and print out some free templates from the internet. I do a lot of paper crafts so I had some fun making my own more decorative versions. 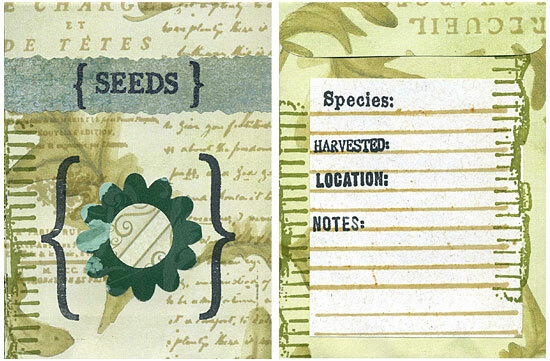 Here are instructions for these seed packets if you would like to make some like them. We also have a pre-printed PDF template you can download to make more utilitarian looking seed packets. As this year’s growing season progresses, you may want to start saving and storing some seeds for the 2017 season. Every plant is not a good candidate for seed saving, for example hybrids will not breed true from seed. Some hybrids don’t produce seed at all. Some cultivars are stable and some are not. I suspect that these Columbines, the parent plants having been acquired through a seed swap, are the descendants of hybrids. The swapper labeled these as blue and red but they and their descendants came out pink and purple. I would have rather had blue and red, but these are nice too so that’s ok. It’s hard to grow anything where I live so I’m not going to turn up my nose at something that is pretty and grows really well for me! You never know what is going to come out when you plant the seeds of a hybrid or of a plant that is likely to cross-pollinate with other plants in the vicinity. You might find this uncertainty part of the fun of gardening or an annoyance depending on what you are trying to do. This year I have a bunch of seedlings coming up that came from a Columbine plant that I know is a hybrid because I have the seed packet and it says so. I don’t know what the resulting plants are going to look like. If I don’t like them I just won’t save their progeny. Each year I grow petunias that are descended from seeds that my Mom and Dad got in a pack at Aldi in the 1980s. I don’t know from year to year if the flowers are going to be white, purple, magenta, or pink but that’s part of the fun for me! They’re all pretty so I don’t care. If you’re growing food or trying to breed plants for specific traits you need to know a lot more about where your seed stock comes from and what pollen it’s exposed to. For example if you’re growing one type of vegetable and your neighbor is growing one that is similar but not the same they could cross-pollinate. If that is a concern it’s good to know how your plant is pollinated and how to prevent cross-pollination. If you are not sure whether your plant is a good candidate for seed saving or how to do it, it’s best to look up the recommendations for that particular plant. 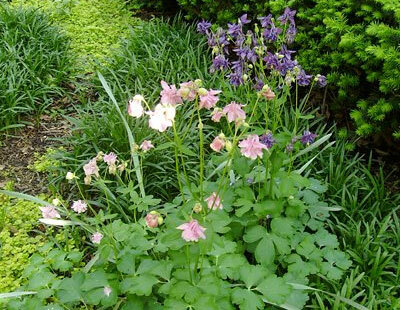 Aside from some of my Columbines, my garden has few hybrids. In my case one reason is so that I can reliably save seeds so I have some trading stock or when I want to grow more of a particular plant. Species plants are often more attractive to wildlife than hybrids, and wildlife is an important part of my garden. I also am not allowed to grow vegetables where I live (unless they are in containers on the deck) – I mostly concentrate on herbs and wildflowers. Wildflowers are good candidates for seed saving because they need to reproduce without human help and can be open pollinated. Many herbs if you get the species plant and not a hybrid will grow true from seed. I harvest when the seeds are brown and starting to get loose and the pod if there is one is starting to come open. When I cut the pods or seed heads to save them, I store them in paper bags that I have labeled with the species and date of harvest. I hang these bags from a chain in my closet for at least a month – then they are dry enough to separate the seeds from the chaff. I sometimes don’t bother to separate the seeds until I’m ready to plant them or put them in envelopes for trading. I collect the seeds from the healthiest plants and try to mingle the seeds of several parent plants together so the genetic diversity is greater. I’ve never noticed any strange mutations but if you get one you might be able to start a new variety! If you don’t have any of these plants take a look at what reseeds itself and breeds true in your own garden and try those first!